2018 Convention Exclusives – Online Pre-Sale Coming Soon! You are here: NECAOnline.com » Blog » San Diego Comic Con » 2018 Convention Exclusives – Online Pre-Sale Coming Soon! 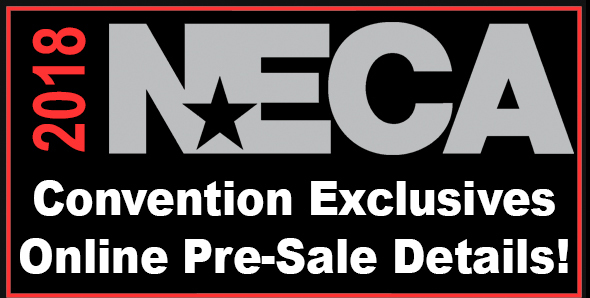 We will make a limited quantity of our exclusives available for pre-order at The NECA Store beginning June 6, and shipping will be offered (to U.S. addresses only). Keep reading for important details! 2) at our booth at SDCC. They will not be available in stores or on other websites at any point. Each day from 6/6 to 6/8 we will put a set quantity of exclusives up on The NECA Store. Pre-orders will open at 1 PM EST (10 AM PST) each day and continue for as long as the limited quantity lasts. Once that quantity is sold out, that day’s sale is over. –> Got questions? Check out the 2018 Convention Exclusives Pre-Sale FAQ! Need a refresher on our 2018 Convention Exclusives? CLICK HERE for a full recap, updated as more are revealed!